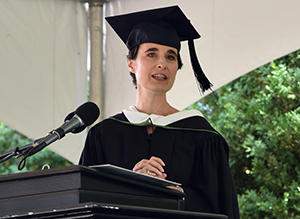 Virginia House of Delegates member Jennifer Barton Boysko ’89 welcomed the class of 2018 to “the ranks of the strong, barrier-breaking women who have come before you” during the 176th commencement exercises on May 20. 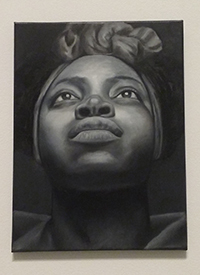 This self-portrait by art major Brittany Lewis ’18 was part of the senior exhibition displayed in the Wilson Museum in May. It was one in a series she created using grisaille painting, a centuries-old technique that emphasizes shades of gray and creates the semblance of sculpture. Lewis said that she only started realistic painting her senior year. WWW To read more about Lewis and her work, visit www.hollins.edu/news. Emili McPhail ’18 was crowned Miss Virginia in June. She is the second alumna in two years to win the title. 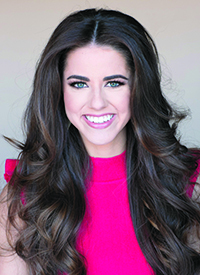 McPhail succeeds Cecili Weber ’17, who reigned as Miss Virginia 2017. “Ending Hunger in the U.S.” was the communication studies major’s platform. Four rising seniors who intend to pursue careers in STEM fields got the chance this summer to intern at one of the nation’s foremost academic medical centers. 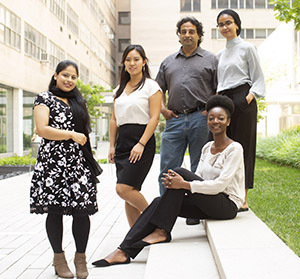 Biology majors Ya Gao and Assma Shabab and chemistry majors Veronica Able-Thomas and Rania Asif spent eight weeks in June and July working at the NYU Langone Medical Center in Manhattan. “Growing numbers of Hollins students are interested in STEM fields,” said Karen Cardozo, Hollins’ executive director of career development. To help STEM students become more competitive candidates for postgraduate education, she called upon her brother, Timothy J. Cardozo, who is an associate professor in the department of biochemistry and molecular pharmacology at NYU Langone. The internship program furthers Timothy Cardozo’s relationship with Hollins. Last April, he participated in a “PreMed Plus” panel at the university, joining alumnae and others who hold a variety of roles in a range of health care fields. He also provided informal mentoring to students especially interested in the M.D. and/or Ph.D. tracks. 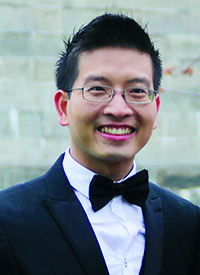 Born and raised in Vietnam, Assistant Professor of Chemistry Son Hong Nguyen moved to the United States in 2004. After receiving a Ph.D. in organic chemistry from Tufts in 2015, he did postdoctoral research in biochemistry at the University of Massachusetts-Worcester. Among his research interests is the design and development of probes for the detection of cysteine-containing proteins. Stephen R. Wassell, associate professor of mathematics, received a B.S. in architecture in 1984, a Ph.D. in mathematics in 1990, and an M.C.S. in computer science in 1999, all from the University of Virginia. He has been a professor for more than 25 years, mostly at Sweet Briar College but also at the University of Virginia, Randolph-Macon College, and, most recently, the American University of Malta. His primary research focus is on the relationships between architecture and mathematics, which means he explores the mathematics of beauty. He has published many articles and has co-authored three books. When Professor of Chemistry Sandra “Sandy” Boatman interviewed for the chemistry job at Hollins in 1967, she was struck by the liveliness of the students she spoke with. “They enjoyed each other and seemed to have a lot of fun. That made the other places where I interviewed seem relatively dull,” she says. She was also impressed by the “emphasis [at Hollins] on undergraduate research.” Through her own hands-on approach to teaching and her support of the annual Science Seminar, now in its 61st year, Boatman has throughout her teaching career been a booster of serious research among science students. The following tributes, written on the occasion of Boatman’s retirement in June, speak not only to her dedication to teaching and research but also to her impact as a mentor and friend. It’s a privilege to have known Sandy for more than three decades. First and foremost Sandy has been dedicated to her students, to Hollins, and to women’s education. As a teacher, she was attuned to the needs and abilities of her students and always tried to help each and every one of them learn chemistry. She extended her organic chemistry class hours, adding two extra days of 45-minute classes at 8:00 a.m. I don’t know of any other class on campus that meets five days a week. Sandy believes in students to be active learners and has made students in her biochemistry classes study papers published in peer-reviewed journals and then present them in class. She believes strongly that the best way of educating students in chemistry is to get them involved in laboratory research and has mentored a large number of them—from first years to seniors—during her tenure at Hollins. One of her students, Mary Beth Hatten ’71, was elected to the National Academy of Sciences (NAS) in May 2017, recognizing her distinguished and continuing achievements in original research, a unique honor for both Mary Beth and Sandy. She worked hard to obtain funding for research and analytical instruments for the chemistry labs at Hollins. She wrote successful grant proposals, traveled with former president Maggie O’Brien to raise funds for lab instruments, and attracted funds for the department from alumnae. Sandy has a genuine compassion for her students. She can spend hours on end helping a student get the required information for applying to a professional school or to modify a procedure to carry out a research project in her lab or talk to a shy international student and make her feel comfortable. I have found Sandy to be a person whose love for knowledge is boundless. She was trained as an organic chemist, but she learned and carried out research in virology, has learned and been teaching biochemistry for a long time, and would learn and teach a subject if any student(s) needed to take it. Her compassion and genuine concern for students have made her one of the most respected and loved professors, and her honesty, support, and straightforwardness have made her a dear friend to me. When I came to Hollins, which at this point was more than 25 years ago, Sandy had already been here for about a quarter of a century. With that many years behind her, it was easy for her to be the kind of person she was for me. At the gathering, I told her that I had never properly thanked her for her able mentorship over the years and that I would be remiss if I did not do so that day. After giving her a heart-felt embrace, I thanked her for all she taught me. The things I learned from her are too numerous of course to list here; suffice it to say Sandy had a huge hand in my success as an instructor. Over the years, and largely by her example, she taught me how to think with greater clarity, to speak with greater eloquence, and to write with greater persuasiveness. It’s not an exaggeration to say that Sandy is a rock and that the chemistry department has enjoyed a firm foundation because of her presence in it. I will sorely miss Sandy’s humor, her kindness, her infectious smile, her good judgement, and her enormous intellect. Professor Sandy Boatman was my first chemistry professor at Hollins. Initially I did not know I would major in chemistry, but I quickly realized that chemistry was both fascinating and challenging. Professor Boatman is wise and learned, but equally important, she takes complex issues and walks students through them, so we can successfully learn and reach our goals. Having both an excellent researcher and teacher is hard to find. Her willingness to encourage me to present our research at a conference was valuable and confidence building. I am certain that I would not have been as good a family doctor and medical teacher without the guidance and mentoring of Professor Boatman. Her willingness to allow students to call her “Sandy” gave a collegiality that is not available everywhere. She invited me to her home and taught me to play bridge, an important part of my liberal arts education. I was so impressed when she, Harriet Gray, and (the now-late) Caren Diefenderfer came to our home volleyball games. Words cannot express the love and appreciation I have for Sandy Boatman. I wish her all the best in her well-deserved retirement. 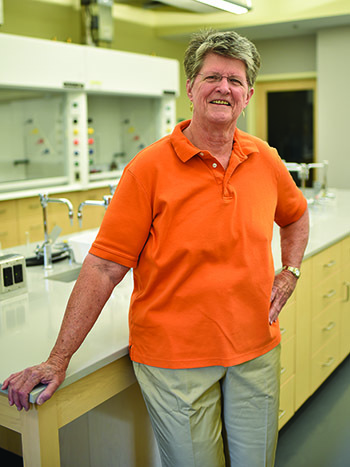 Sandra “Sandy” Boatman is an institution of Hollins science and chemistry. A fond memory I have was turning the corner into her office with a chemistry experiment in hand that had a different result from what we had predicted. She would respond with, “Oh, that is interesting,” along with a change to the experiment, meaning that I would be in the lab for hours on end and into the weekend. Many times Professor Boatman would walk into the organic chemistry lab when I was decked out with gloves, full lab coat, and googles on top of my glasses and proceed to tell me how ridiculous I looked, which I did. But at the end of the day she was always there when I needed her. Professor Boatman inspired generations of women in science. She provided us with confidence to speak up when we were right and corrected us when we were wrong. She taught me valuable lessons beyond chemistry, about life and myself. I will be forever grateful for having her guidance during my time at Hollins. Before her retirement in June, Nancy Peterson spent 46 years with the riding program, many of them as director. During her tenure, Hollins riders earned 19 individual IHSA national championships, two team national championships, and four Fitch Trophy/Cacchione Cup Individual National High Point Rider championships. Teams qualified 12 times for IHSA Nationals, and won the Old Dominion Athletic Conference championship 20 times. Peterson herself won ODAC Coach of the Year honor five times. The Virginia Horse Shows Association named her 2004 Horseperson of the Year. In 2012, she was named to the association’s Hall of Fame. In 2016, she received the J. Arthur Reynolds Sportsmanship Award. What follows are some of Peterson’s own reflections on her long career, along with accolades from others who learned from her or worked with her. My love for Hollins started at a very early age, as I grew up right across the road. After school each day I would ride my horse over to Hollins and ride with the Hollins riders. 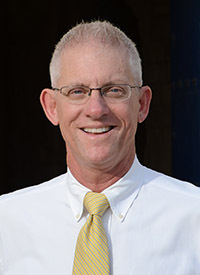 After graduating from Roanoke College, I became Guy “Red” Burkholder’s assistant, stayed in that position, and grew as a teacher, rider, and an individual. In those years, being a professional horsewoman was not exactly what my parents had in mind for their daughter, but with determination and grit I made it work. The joy of this job is the students themselves. Seeing them grow from (sometimes) struggling first-year students to confident, well-rounded adults at graduation is a reward. In this business you educate just as much as other faculty, but it’s a different type of progression. I consider [riding] a complement to their complete education, whether the student is a new rider or an accomplished rider who enters the gates as a wonderful junior rider and leaves ready to become a professional horsewoman. Nancy Peterson is a Hollins icon. Those of us lucky enough to ride with her left Hollins not only better equestrians but also better people. She guided us with unwavering devotion and commitment. For many of us, our equestrian lives had consisted of competing in an individual sport. At Hollins under Nancy we became members of a team, which she led with exceptional horsemanship, humor, and honor. She expected our best and brought it out of us while understanding and managing college girls who often made decisions based on impulse rather than thoughtful consideration. My years at Hollins were some of the best in my life. I continue to look back on all that shaped me and realize much of it came from the four years I spent in the foothills of the Blue Ridge Mountains. Nancy Peterson was a major contributor in my years at Hollins. I thank you, lovely Nancy, for giving so much of yourself to me and so many other fortunate Hollins girls. From beginners to accomplished competitors, you gave it your all. Hollins + Riding + Nancy = Hollins Magic. You know Hollins Magic—that unique combination of people, place, dedication, excellence, learning, support, and passion at Hollins. The Hollins riding program reflects the very essence of Hollins Magic, and to me—and hundreds of you—it is because of Nancy Peterson. I can’t imagine my Hollins experience, or describe it as I have at dozens of career talks, without including the large role that riding had for me. Nancy was my first instructor—that one-of-a-kind voice coaching rider and horse to work as one. No matter what level a rider was, Nancy only had words of encouragement. She challenged us to do more, try harder, and push ourselves to be the best we could be, and to get up and try again when we found ourselves on the ground. 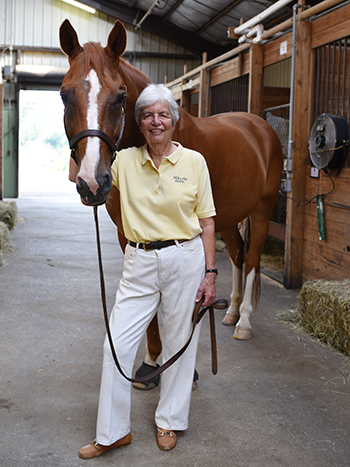 Nancy knows and cares about the “story” of every horse and every rider, and she dedicated her life to making the riding program reflect her passion for excellence—and Hollins Magic. I loved riding at Hollins! I loved getting away from my studies and just getting to the barn and immersing myself in that world. I started riding at Hollins when Nancy was bridging the program “between barns” and implementing the next generation of riding at Hollins after Guy “Red” Burkholder retired. I was part of the cohort that rode and showed in the outdoor ring or the lower field in almost any weather. I was lucky to be there for the grand opening of the glorious Kirby Riding Ring (spoiling us ever since). The riding program grew better and stronger under Nancy’s leadership, and her absolute love for the riders, the horses, and the community put Hollins riding on the map like never before. I wasn’t a national champion and never advanced beyond Intermediate showing. But in 1983, I won “Schooling Hunter Division Champion” while riding my beloved Hollins horse, Holy Smoke. I remember the feeling like it was yesterday. I felt the way Olympians must feel when they win the gold—and there was Nancy jumping up and down waiting for me as I rode out of the ring with her big smile and her “I knew you could do it—wonderful, wonderful—great job, Liz!” That glorious long ribbon is in my home office as one of many reminders of my Hollins Magic. To this day, the first stop I make when I return to Hollins is to the barn—in the hopes that Nancy will be there, along with Liz and Elise, of course. Nancy, your legacy will forever be part of the very essence of riding at Hollins and the Hollins Magic we are all lucky enough to carry with us always. Presidents are not supposed to have favorite departments in their college. Of course not! However, now that it is many moons since I was at Hollins, I want to confess that, in fact, I did have one or two secret favorites. I’m alluding here of course to the Hollins riding program under the fabulous leadership of Nancy Peterson. My hidden favoritism was linked directly to Nancy herself. When I arrived at Hollins in the summer of 1981, the old barn with its small riding ring had burned down the year before. I soon met the then-riding Instructor, sunny and cheerful and immensely knowledgeable, filling me in on the program and its physical needs. She was and is the Nancy we know and cherish: passionate about her students and about building a community out of the riding students and staff, and passionate about each one of the horses and their well-being. The Hollins riding program year by year has gone from strength to strength; knowledgeable riders can speak to that amazing, consistent accomplishment. I am not a rider (alas!) but can recognize the kind and effective leadership that so nurtured this long and splendid riding program. To this day, whenever I get back to campus, I always visit the barn, hoping so much to see Nancy and her great colleagues, Liz and Elise, whom I have known for so long. Nancy Peterson leaves a long-lasting legacy fully in keeping with Hollins’ highest aspirations.